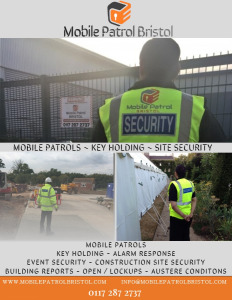 Mobile Patrol Bristol is a Bristol based security company offering Mobile Patrols, Key Holding and Security Guard services. We carry 10 Million Pounds insurance. We can always stand up for the job on short notices with flexible working hours to suit your needs. Competitive rates with no extra charges or hidden costs. Flexible working approach and personalised service to suit your requirements. No contract restrictions means customers are always in control to terminate and resume services.